OK, so it’s still a bit cold, but it’s definitely time to unwrap your bike and get back on it – assuming you’ve been protecting it from all the ice and salt, and not just riding everyday anyway. It may not be betty-inducing hot out, but there’s only so long you can go without riding before the need will grab you by the danglies and force you to thumb the starter. So what’s in the issue then? With Yamaha’s new R6 claiming some increased midrange in an attempt to reform the psycho track-lover into a class contender, we take all the 600s to Circuit Cartegena in Spain to thrash out some answers. First ride on UK roads of KTM’s big single street mentalist. KTM’s road-legal quad makes light work of last month’s snow – check it out, it’s barking. Rootsy takes a look at the decade that changed biking beyond our wildest dreams. 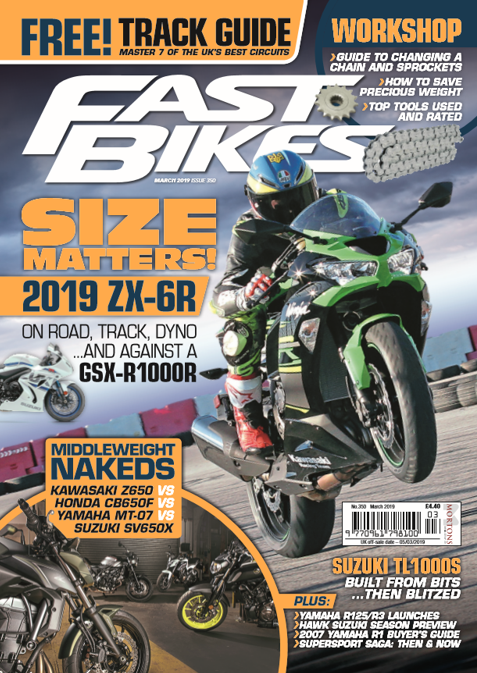 BJ gets to ride a stack of WSB and WSS bikes at Portimao – his first time in the saddle of such sexual machinery – this is his story. Few bikes are in this condition after a year, let alone 24 of them. Super-rare ‘Double R’ slabside 750, plus every single model of GSX-R750 for your viewing pleasure. Race Feature – MotoGP Meltdown?